* Term officially obsolete. Classed by the Post Office Engineering Department as a skilled workman (311). (ii) is usually employed in cleaning out manholes, etc. ; but in case of a breakdown becomes one of a breakdown gang, sent up to repair conductor rails, bonds, etc., as described above. see cable hand (electric conduit tramways). as for cable hand (electric conduit tramways). as for cable band (electric conduit tramways). examines and tests (by observation and/or by various electrical tests with voltmeter, ammeter, etc., or by connecting to switchboard) flexible wires used in electrical work, to detect faulty material or workmanship. a cord examiner q.v. who visits telephone exchanges to examine instruments and flexible cords used on switchboards; tests by visual examination and/or with help of battery and buzzer; replaces or renews defective cords, using pliers, screwdriver, and other hand tools. (ii) in mines and, quarries , has statutory duties under Coal Mines Act in connection with maintenance of electrical plant in and about mine or quarry. attends to electric light fittings, switches, and fuses in a house or other building; does repairs; keeps electric bells in order; sometimes also maintains electric cookers, heaters, kettles, irons, etc., in good condition. (ii) makes joints by hand in heavy cables or cores; insulates them, and completes them (if cable is lead-covered) with plumber's watertight lead joints; also makes connections in underground boxes. a specialised cable jointer q.v. who is responsible for repair and renewal of low tension cables (technically known as "connections") carrying electricity to different sections of contact rail, and for joints between cable and cable and between cable and contact rail; connects wires, and makes "plumber's joint" therein; is in charge of job, and has a number of men working under him, in cases of renewal, or of laying of new cables. a cable jointer q.v. mainly employed in submarine cable work, for which gutta percha is largely used, either on a cable ship or in a factory. joins, by brazing, two lengths of electric wire; (in telegraph cable works) sometimes also operates a stranding machine. draws up and fixes overhead electric wires; repairs and makes good, breakages of wires; traces and searches along lines of wires for "live" spans, and re-insulates them; attends to section pillars; may also instal telegraph or telephone apparatus, and remove faults, if any. has charge of maintenance of overhead telegraph and telephone system, in connection with railway signalling system, throughout a specified area; directs telegraph linemen q.v. and also works as a lineman if necessary; similarly employed on erection of new lines; cf. chief lineman (261). an electrician or wireman q.v. who maintains in repair electric lighting installation; wires and lays pipes carrying current, fits insulators, adjusts electrical instruments and electrical locking apparatus. a lineman q.v. who under direction of chief lineman fits up, overhauls and repairs as necessary, overhead lines and signal box instruments for telegraphs or telephones in connection with railway signalling system, within a specified area; works either alone or assisted by lineman's assistant q.v. assists telegraph lineman q.v. either rendering personal assistance in execution of jobs or himself performing jobs when so instructed; in process of becoming qualified for promotion to grade of lineman. carries out outside constructional work for overhead wires or cables conveying electric power; erects and maintains high pressure transmission lines; runs service lines and branch wires; erects lanterns and lamps; fixes and connects street switch boxes and lamp circuits. fixes meter boards and meters, and connects them up to supply cables and to consumer's wiring, by hand, using screwdriver, pliers, and, if necessary, soldering bit, etc. ; in some firms partly engaged as electrician or wireman q.v. an electrical fitter (306) q.v. engaged in fixing electric motors. general term covering all men. employed in Post Office Engineering Department on skilled work; see those terms marked with asterisk. an electrician q.v. 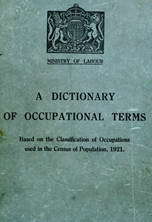 mainly engaged in indoor work e.g., wiring interiors of houses, as distinguished from outdoor wireman or linesman. a member of a gang engaged in erection or repair of overhead telegraph or telephone wires and wiring work, and in -jointing, regulating, binding, and terminating of these wires. strips, forms, and laces switchboard cables, and connects them to tags on apparatus racks and switchboards. does routine erecting and wiring tip of telephone switchboards. (ii) joins together wires making up leading-in wire of lamp.